Greetings from ‘A WALK 4 PEACE ORGANIZATION’. Myself Guvvala Joseph Anthony writing to you in reference of my mission ‘A Walk 4 Peace’. 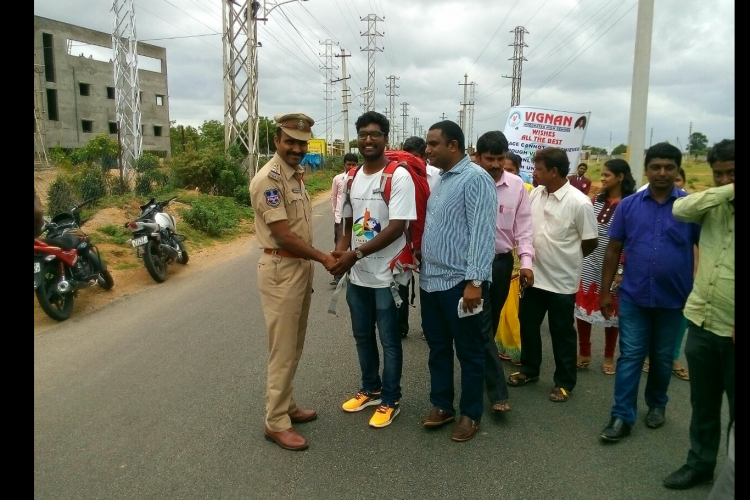 The on the foot mission started on 1st July’2016 from Hyderabad and reached New Delhi on 10th September’2016 by covering 2000kms.On the way, I visited many schools, colleges and universities (Refer Gallery from the website: www.awalk4peace.org) and the larger response was truly overwhelming whereby as per me it was due to these blessings and wishes of the people that I could reach New Delhi safe and sound. To my mind this was the first taste of success for the ‘Global Mission’. The mission is registered with the Government of India, Ministry Of Corporate Affairs (Under Rule 8 as Non-Profit Organization) and notified with President and Vice President’s office, Prime Minister’s Office, Ministry of Home Affairs and Human Resource & Development Ministry. An on the foot journey of 20,000kms spread across India &9 neighboring countries. The ‘THE PEACE HOLY BOOK’ written by the world citizens for the world to be distributed throughout the Globe. In the second leg, the mission would be touching the heart of India i.e. Delhi by visiting 3000 Schools, Colleges and Universities in DELHI/NCR. Simultaneously, the Global launch of the mission shall happen with the help our website (www.awalk4peace.org), mobile apps (Android and IOS), Social media, Electronic media, and Print media platforms. In the second phase, the missionshall embark its international journey of visiting 9 neighboring countries of India (Afghanistan, Bangladesh, Bhutan, China, India, Maldives, Myanmar, Nepal, Pakistan and Sri Lanka) which covers approximately 20,000kms and 3 years to complete. A Walk 4 Peace missionaims to promote Global PEACE and harmony through PEACE awareness education to inspire the world citizens and to collect the PEACE messages from every corner of the globe to raise voice for global PEACE. These PEACE messages will be inscribed in the ‘PEACE HOLY BOOK’ and the pride of this contribution will be unmatched, which is the backbone of this mission. So it’s apt to say here that ‘PEACE HOLY BOOK’ is the book ‘written by the world for the world’. 'THE PEACE HOLY BOOK' shall be launched in Delhi (INDIA) with the help of the Government of India and with positive participation from the delegates of the nations invited by the mission. The launch event at New Delhi is expected to be attended by approx 1 millionstudents from across the institutions. I shall be carrying along the ‘THE PEACE HOLY BOOK’ with me to the nine neighboring countries which would be presented to the key dignitaries of the respective nation.I strongly believe that ‘PEACE is fundamental to all the stability, progress and growth of the mankind’. The objective of this mission is, we and the coming generations must have to practice and promote to live in PEACE and Harmony. This is Our Vision. This mission is nurturing in my mind since last 20 years and my inner voice says we can play a significant role in bringing PEACE consciousness into this world. Event@New Delhi: Global Launch of the Logo, Website, Apps(Android &ios) and mission theme video. Real-time recording and updating of the on the foot mission – NCR and 9 neighboring countries. An ongoing reiteration & reinforcement of ‘Peace First’ awareness across the Global Media, social media platforms & communication channels. Concept, creation and the worldwide distribution of the ‘The Peace Holy Book’ compiled from millions of peace messages over the period of time. Global epic Event for the launch of ‘The Peace Holy Book’ to be attended by the dignitaries and delegates from world nations – Approximate attendance 2 Lacs students. Conducting & supporting the Peace awareness events & programs across educational institutions. Founder Of‘A Walk 4 Peace Organization’. Your share could be as good as a donation for A walk 4 Peace! Not everyone can afford to take care of their loved ones. A walk 4 Peace's life can only be saved by donations made by kind people like you.